The build of the 45m Dixon Yacht Design sloopY3 is now well underway at Holland Jachtbouw. The aluminium hull and deck were delivered to the shipyard in September, the metal work having been fabricated by Bloemsma Aluminiumbouw in Makkum. The performance sloop will have a slippery hull shape developed over many years by Dixon Yacht Design (carrying the beam quite far aft to improve stability) and a high modulus rig by Southern Spars, with composite rigging ample to move the 200 tonne boat even in light airs. For ease of operation the low profile deck gives the helmsperson unrestricted visibility and the designers have installed a battery of hydraulic captive winches under the foredeck, controlling the mainsheet, runners and jib sheets. 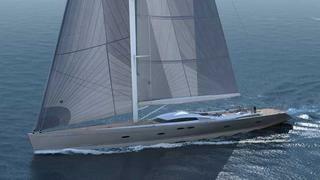 Berg expects the yacht to be ‘reactive, responsive and powerful’. The yacht also features a clever automated Bimini that shades lounging and dining areas in the cockpit but retracts neatly into deck when not needed. Further down, Y3 has a lifting keel developed with Italian keel manufacturer APM, which retracts into a skeg on the bottom of the boat in a way similar to a telescope. ‘A lot of keel arrangements tend to block off the interior with a great big box, but this one doesn’t, so it’s allowed us to really maximise the saloon,’ says Berg. Rhoades Young Design has been commissioned to design the interior and has placed the owner and guest cabins forward for quietness and discreet crew circulation while moored stern to.